Call Us - Our Experts Will Be Happy To Help! Home / Info / Call Us - Our Experts Will Be Happy To Help! We apologize that you have landed on this page. It means that the item you were looking for is either discontinued or has had a design improvement. But Don’t Worry, we will Help You! There is an excellent chance we will be able to suggest an alternative that will work. First Click on the Left Side Navigation to view our Large Selection of Clock Parts and locate the category that you are looking for? Then simply Click into the Category to see our selection. If you were not able to find a suitable alternative please call one of our Well Trained Clock Experts at 888-827-2387 to guide you to the Best Alternative Parts for your project. 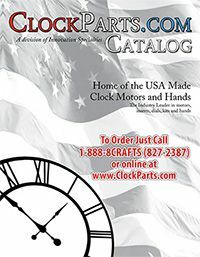 Also Remember to Download our latest Clock Parts Catalog. We are glad to help you with technical support, a great selection and a wonderful catalog.